Like most other Canadians, I’ve had a hard time processing everything that has happened in Canada this past week. It seemed that the peaceable kingdom had been turned upside down, with soldiers being killed on our streets for the crime of being, well, soldiers. The best I can do today is go over a few points; there’s almost too much to absorb. • Canadian TV coverage was both very good, and very bad. Some American commentators have heaped praised on the CBC’s permanent anchor, Peter Mansbridge, for his rock solid anchoring of the emerging tragedy. I never thought of it, but they’re right. Mansbridge is a total pro, keeping things in perspective and very smartly letting the public know that even the professional reporters had a hard time getting things straight. But the other networks acquitted themselves well. CTV had muscular Kevin Newman at the anchor desk, and he was cool and calm. Global was fine as well. All of them could have gone off on panicky tangents, but they didn’t. I can’t say the same for the B team that populates the morning news shows on CTV News Network and CBC Newsworld. In the early going of the crisis, the Newsworld anchor, a woman whose name escapes me, was in so far over her head it was almost embarrassing to watch. At one point, she said something like “Not to be too dramatic here, but Parliament is under attack!” Seriously. • Another low point in the coverage came not from the media, but from the police. When the Ottawa police and the RCMP finally held a press conference, no doubt seen live around the world, they conspired to say absolutely nothing. Not one shred of new information came out of the press conference, as the cops held fast to their talking points. It was embarrassing to watch. • High praise must go to Josh Wingrove of the Globe and Mail. When gunshots rang out and people were running for cover, he tagged along with the security people and captured the images of the gunfight that ended the crisis. Nobody has given him credit for guts, but he deserves it. He willingly went into a dangerous situation, and recorded the whole incident. Perhaps no piece of Canadian news footage in history has been seen and replayed more than Wingrove’s clip. • Still with the media, the next day’s Edmonton Sun front page was the greatest missed opportunity I’ve ever seen by a newspaper. In place of an actual news photo — and God knows there were dozens of arresting images — the Sun chose to display a huge maple leaf, with the headline “We will not be intimidated: PM Harper’s vow after hears of Canadian democracy attached.” While even politicians were putting politics aside, the Sun couldn’t resist giving their hero Harper the Winston Churchill treatment. The next day, one of their stable of hacks devoted a column praising Harper to the skies for his utterly uninspiring post-shooting speech. • Now to the use of the H word, as in hero. Was Corp. Nathan Cirillo a hero? Sadly, no. He was an innocent victim of a scumbag, and his loss is utterly heartbreaking and enraging at the same time. But hero? No, sorry. He was a guy doing a sacred duty who was in the right place (guarding the war memorial) at the wrong time. But the remarkable collection of people who attended to him until the ambulance came, tending to his wounds, giving him CPR, giving him comfort? Yes, those are heroes. And needless to say, the true hero of the piece is Kevin Vickers, the seargeant-at-arms who calmly dispatched the shooter with a few remarkably well placed shots, then let cowering MPs know it was safe to leave. Now, that is a hero. • As terrible as this week has been, it at the very least gave us profoundly Canadian, lump-in-the-throat moments. When Vickers entered the House of Commons the next day to a roaring ovation from MPs, you couldn’t help but feel deep pride in the Canadian way. As silly as the whole ceremony looks, it represents the way our democracy works, and returning to work after such a traumatic day sent a profound message. And then there were the thousands who saluted the funeral procession of Cpl. Cirillo on the ‘Highway of Heroes’, a spontaneous display of solidarity and determination. Ya gotta love this country. • And finally, the big questions. Was this our 9-11? Of course not. Did we ‘lose our innocence’ on that day? No; only the most naive Canadian thought this couldn’t happen in Canada. Will Canada ‘never be the same again’? No; it will change a little, in that it will be harder to get into public buildings and we’ll be more alert to questionable characters. But I don’t think one creep with a gun can change an entire country. Canada was a great and open country before October 22, 2014, and it will remain a great and open country after October 22, 2014. We’re blessed to live in this great nation, even if there are some who don’t feel the same way. 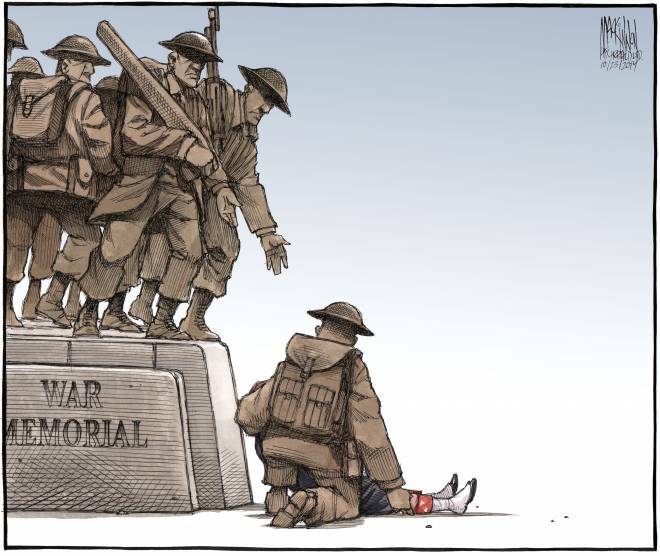 • Finally, this magnificent editorial cartoon, by Bruce MacKinnon of the Halifax Chronicle Herald, deserves to be seen by every Canadian.